Cool Colors. Hot Sales Tools. Get your store ready for Mother’s Day with our new colored stone items and receive a free Birthstone Flipchart with any order. 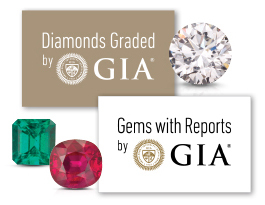 For stores carrying diamonds or gems with GIA reports, this retailer-specific logo can be used on websites or in print. Register your store on the GIA 4Cs app for consumers. Consumers will be able to locate stores that offer diamonds graded by GIA or have GIA-trained sales associates on staff directly from the app. Visit the new GIA Download center for videos, posters, graphics, interactive tools, and a host of other assets to help you communicate with your customers. GIA offers social media tools and shareable diamond and gemstone content to help you engage with your community.